Blog Hoppin': Presenting Magic Elf! and some Magic Elf FREEBIES! Presenting Magic Elf! and some Magic Elf FREEBIES! Have you met Magic Elf?? ...holding a note that explained why Santa had sent him-to remind my class all about the true meaning of Christmas, namely that Christmas is a time for joy, sharing, love, family, being neighborly, and many more things! Each night, he flew around the room and landed in a different spot. When the children came in the next morning, they would find him with a new note! People, my kidlets went cuckoo for Cocoa puffs over this little guy! Like, for reals! Magic Elf also would watch for good behavior and report back to Santa the students who were following the rules and showing each other the true meaning of the holidays. 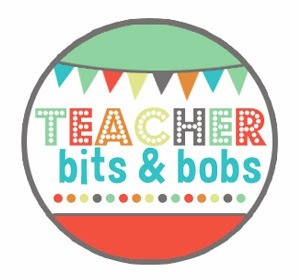 I kid you not, my students' behavior was AMAZING the month of December, and as we all know, most kids' behavior gets a little, shall we say, NUTSO the month before Christmas! Am I right?? Some days, certain well-behaved students would walk in to find a certificate from Magic Elf on their desk, congratulating them on showing the true meaning of Christmas. My kids ATE. IT. UP! We also had a Magic Elf book that we worked on the whole month, and each day we would write what Magic Elf had taught us for the day and illustrate how we could show that to others. At the end of the month, my students took the book home to their parents so they could teach them all about the true meaning of Christmas. It was truly precious!! Would you like to experience the Magic in your own classroom?? Presenting, my Magic Elf Writing and Activity Pack!! 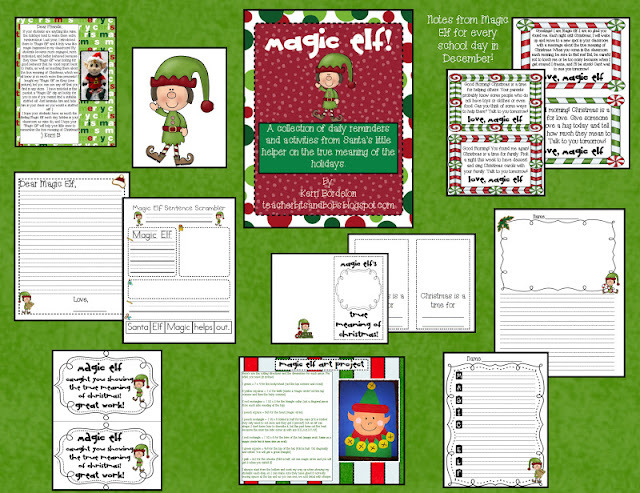 Magic Elf and Daily Messages-Purchase a stuffed elf or laminate the clip art elf that is included in this packet. Laminate messages for durability and cut out. Each morning before your students arrive, hide “Magic Elf” somewhere in your classroom along with one of his messages about the true meaning of Christmas. I have included 17 days worth of messages, so you can choose the ones that work best for you, depending on how many days you are in school the month of December. Magic Elf Story Paper-Students can write a story about Magic Elf visiting their classroom, and then illustrate their story. Magic Elf Letter-Students can use the writing paper to write a letter to Magic Elf about what he has taught them, or what they would like him to tell Santa! Magic Elf Book-Copy the cover and inside pages back to back, including as many inside pages as there are school days in December. Instruct students to draw Magic Elf on the cover. Every day, after reading Magic Elf’s clue each morning to your students, instruct them to write what Magic Elf’s meaning of Christmas was for the day and illustrate what that means to them. At the end of the month, your students will have their own book on the meaning of Christmas to take home and share with their parents! 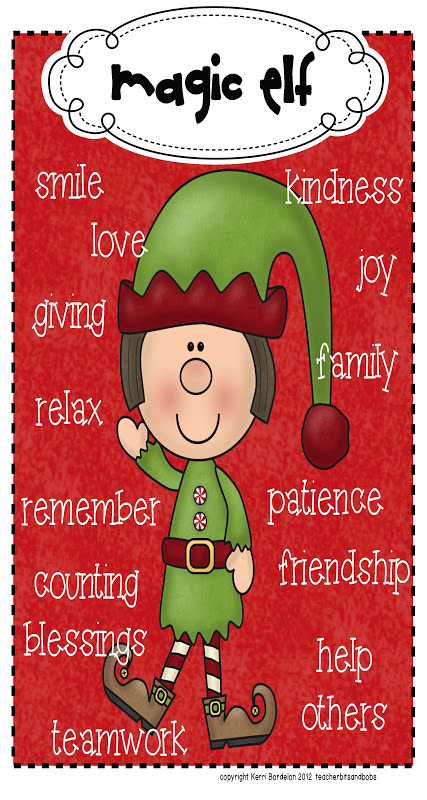 Magic Elf Acrostic- Students can write their own acrostic poem about Magic Elf, or write one together as a class! Magic Elf Certificates- Let Magic Elf pass these certificates out to students who are caught showing the true spirit of Christmas! My students find their certificate on their desk each morning! 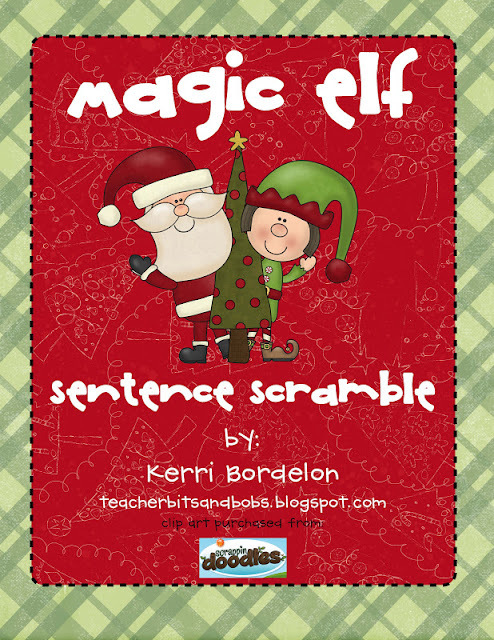 Magic Elf Scramble-Students can unscramble the Magic Elf sentence, glue it in the correct order, write it, and illustrate it! Magic Elf Art Project- Students follow directions to create their very own Magic Elf art project. These look great mounted next to the acrostic poem or Magic Elf Story on construction paper and displayed for all to see! Here is a picture of our Magic Elf art and Acrostic Poems from last year... sooo fun! You can even do this project without any stuffed Magic Elf at all, and simply use the provided clip art elf that I included in my Activity Pack! Would you like some Magic Elf FREEBIES?? Click on the Magic Elf poster above to download your own poster via Google Docs! Have a wonderful week friends and a beautiful Thanksgiving!! I love the idea of Magic Elf. 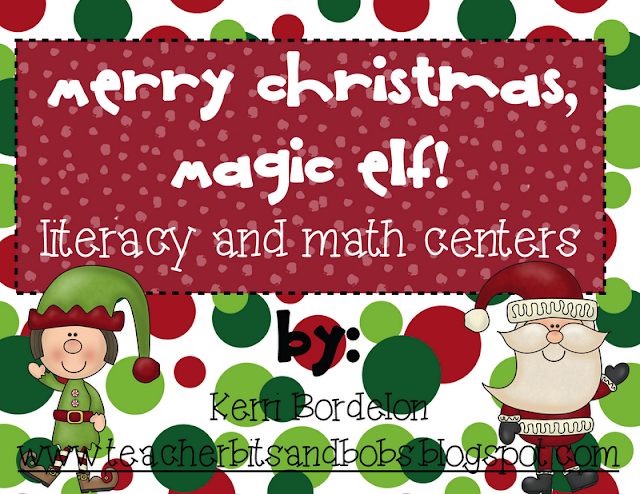 I am off to TpT to purchase the Magic Elf unit and the literacy and math centers that goes with it. They will boy add so much to our December learning (and behavior:). How Cute! I will be checking this out. Love your elfie post and elfie ideas! 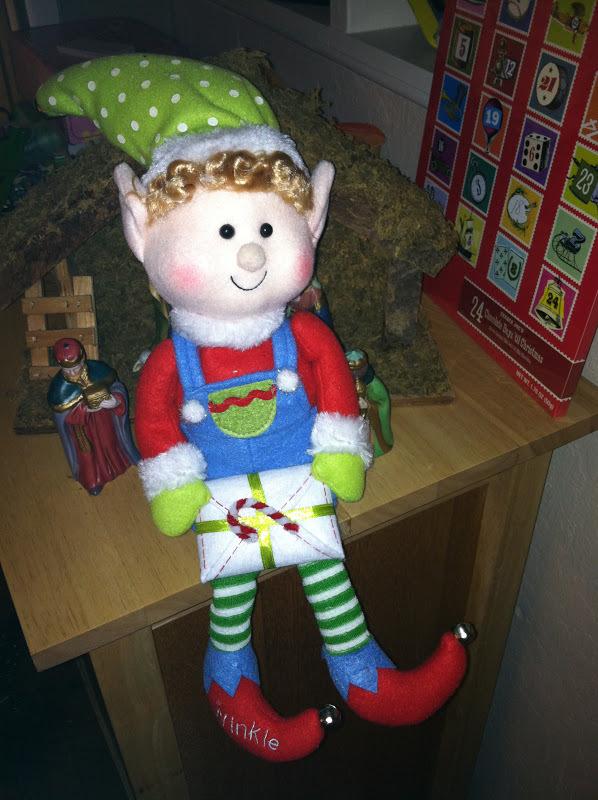 I would love for you to link this post or any other elfie resources at my Elf Class Ideas Linky Party. Thank you! !